Of these, 5,574 were juvenile (under 18 years old) arrests on Chicago Public School properties. School-based arrests of youth accounted for 20 percent of all juvenile arrests (27,563) in the city of Chicago in 2010. Black youth accounted for 74 percent of juvenile school-based arrests in 2010; while Latino youth represented 22.5 percent of these arrests. 45 percent of CPS students are African American while 41 percent are Latino (CPS, 2009). This suggests that black students are disproportionately targeted for arrest in CPS. 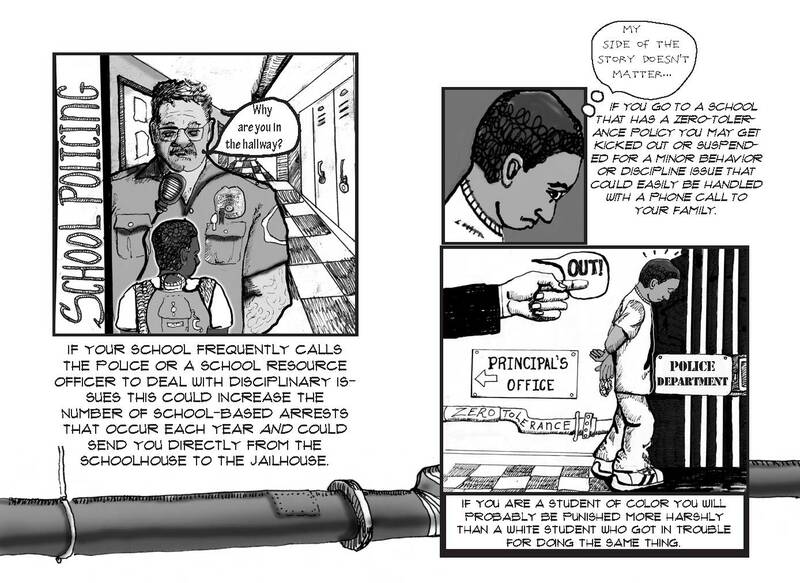 Nearly a third (27%) of juvenile school-based arrest offenses is simple battery. This suggests that a significant number of CPS students are probably being arrested for fighting. The highest aggregate numbers of juvenile school-based arrests are in the 4th, 6th, 8th, 22nd, and 5th police districts. Together these five districts account for 39% of total juvenile school-based arrests on CPS property. •	Requires the Department of Education to report to the City Council on the numbers of suspensions, expulsions, arrests and student-police altercations in schools. The City Council can then track and monitor whether discipline is being enforced equally for all students. •	Provides lawmakers and the public vital access to raw data on school disciplinary actions. Following the lead of New York City, Project NIA convened a coalition of individuals and organizations to press the Chicago Public Schools to make school discipline data more transparent. Initially, the coalition called on Mayor Rahm Emanuel to pass an ordinance mirroring the NYC Student Safety Act. The Chicago Student Safety Act (2012) would require quarterly reporting by the Chicago Public Schools and Chicago Police Department (CPD) to the City Council on school safety and disciplinary issues, including incidents involving arrests and suspensions of students. It would provide the public with raw data to study the impact of disciplinary practices and encourage the crafting of more effective policies. After initial conversations with representatives of the Mayor’s office and the Chicago City Council, the coalition decided to begin conversations directly with CPS administration. Over the course of nearly two years, coalition members had discussions with various CPS administrators including Jadine Chou, John Barker, Jen Loudon, and others. We exchanged proposals and offered counter-proposals requesting particular data that we believed would be helpful in holding ourselves and the schools accountable for interrupting school pushout. After several revisions, coalition members came to a final agreed in early December on data that would be made publicly available via the CPS website. The agreement was endorsed by CPS CEO Dr. Barbara Byrd-Bennett in mid-December. See the UPDATE page for the latest developments and for future announcements.